← Salaries, salaries, Who’s got the salaries? By the establishment’s proclaiming “21st Century Globally Competitive” as some new, heretofore ignored goal, they indisputably demonstrate their own total lack of education. It’s as if they were shouting from the roof tops that we must now begin driving cars with air in the tires. Or when we sit down for dinner, we should eat food! Rather than some newly discovered phenomena, from the very beginning of recorded history every nation has faced the challenge of global competition. 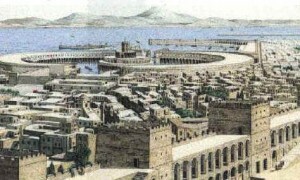 century BC the Phoenician seaport of Carthage became the wealthiest city of its time due to its competitiveness. They developed a strong navy to fend off the Romans in the competition for world trade, and they substituted a republic form of government for the old monarchy to better meet their competitors. Indeed the Age of Exploration beginning in the 15th AD century was spurred on by global competitiveness to find a shipping route around Africa to the Far East that avoided the lengthy land caravans of the Silk Road to China. Which led to the exploratory voyage of Columbus. He wanted to beat the competition. Globally. In the 15th century. The Boston Tea Party in the 18th century was about global competition in the face of high tariffs. From Carthage to Columbus to the Bostonians spanning 3,000 years, the knowledge and skills of the educated citizenry enabled the construction of the ships, the machining of the navigational instruments, the astronomy, and the mathematics and geometry that determined the winners and losers. Those with the knowledge and skills to produce needed goods and transport these goods to new markets survived and prospered. Despite being a proven necessity that has prevailed worldwide throughout recorded history, the education establishment is finally catching up to the necessity for the United States to educate its young students to be globally competitive. And so how do the “educators” propose fulfilling their newly discovered need for a 21st century global competitiveness for our students? By “going all in” with Rousseau’s constructivism as passed down through Dewey and Piaget: ignore the past; disregard all memorized knowledge; eschew practice and fluency of learned skills; abandon tradition and culture. Instead, let’s just focus on everyone hewing to the same common standard so there is no variation or diversity. Yes, and let us develop critical thinking skills based upon a foundation of vapid self-discoveries uninformed by the past. The classical curriculum of 3,000 years is dead. Long live the Common Core. Review -What is the Common Core? How will the Common Core English Standards affect the teaching of great stories in our schools? Will there be any great stories left in the minds of our children when the Common Core has controlled the curriculum and testing of both public and private schools for a few years? What are the real purposes behind the educational coup that has taken place with very little public debate and even less understanding? In this book, school reformer and professor Dr. Terrence Moore carefully examines both the claims made by the architects of the Common Core and the hidden agenda behind the so-called reforms that have been adopted by over forty states in the nation, with very few people understanding what is really going on. Moore not only challenges the illiberal aims of this educational regime, but actually analyzes lessons recommended in the Common Core English Standards and in the new textbooks bearing the Common Core logo. Such a thorough review exposes the absurdity, superficiality, and political bias that can only serve to dumb down the nation’s schools. Worse, the means that the Common Core uses is a deliberate undermining of the great stories of our tradition, the stories that in former times trained the minds and ennobled the souls of young people. Those stories are now under attack, and the minds and souls of the nation’s children are in peril. This entry was posted in Education - K-12, Learning and Education, Politics - NC, Politics - US, Uncategorized. Bookmark the permalink.